Check Customer Service Training Adherence: Encouraging Customers? The Fashion Industry is built on trends. And dreams. Dreams are important because they are embodiments of our expectations. And expectations, as we know, are opportunities in the world of customer service, opportunities to fulfil those expectations and validate a customer’s choices. Companies train their staff in customer service, but it is important to check customer service training adherence; are your staff actually implementing the training they’ve been given to achieve the store goals? As we say, the frontline impacts the bottom-line. Humans are sensory creatures, we enjoy tactile contact with items. As a result allowing a tactile experience with products is vital to making a sale. Encouraging customers to ‘try’ products, particularly in the Fashion Industry, helps them see what it might be like to live with the product they’re thinking of purchasing. The Global Fashion Benchmark Report conducted in 2015/2016 reveals that 77% of fashion shoppers, in particular, want staff to encourage them to try a product. Knowing this, many companies should focus their training on this aspect of the fashion shopping experience, 77% is not a small number, after all. This sort of training, coupled with an emphasis on product knowledge, will definitely impact sales. The Fashion Industry is built on trends. And dreams. Dreams are important, because they are embodiments of our expectations. And expectations, as we know, are opportunities in the world of customer service, opportunities to fulfil those expectations and validate a customer’s choices. Companies train their staff in customer service, but it is important to check customer service training adherence; are your staff actually implementing the training they’ve been given to achieve the store goals? As we say, the frontline impacts the bottom-line. 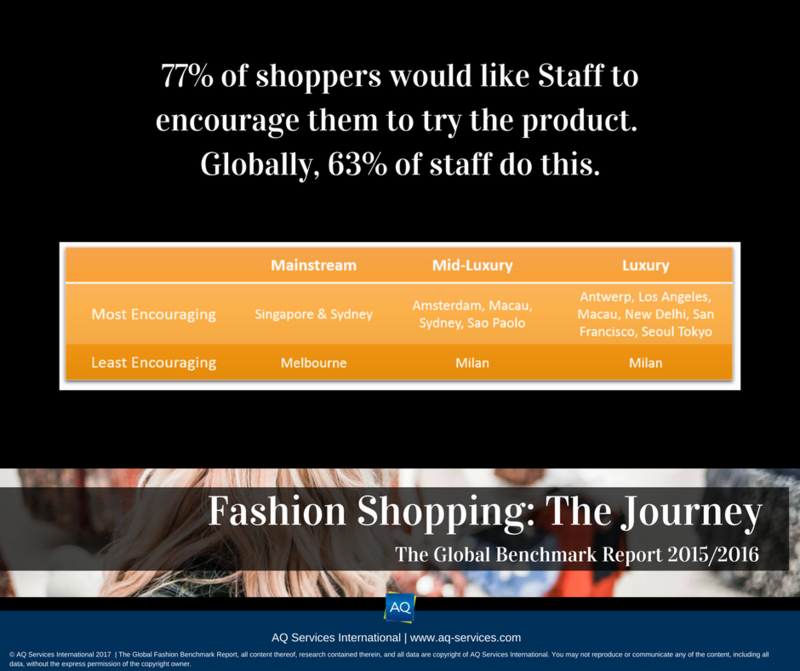 The Global Fashion Benchmark Report conducted in 2015/2016 reveals that 77% of fashion shoppers in particular want staff to encourage them to try a product. Knowing this, many companies should focus their training on this aspect of the fashion shopping experience, 77% is not a small number, after all. This sort of training, coupled with an emphasis on product knowledge, will definitely impact sales. Training is all well and good, making sure that every new staff member knows that it’s important to know their products and to encourage customers to trial a product is very important. But how do we know that it’s working? Internal sales numbers should positively reflect a good training program, but it’s always a good idea to check customer service training adherence – is it all stores that are sticking to the guidelines, or just a few, exceptional employees? We can see from the Benchmark study that, depending on the Fashion Industry segment, some cities are well ahead of others. One might wonder why Melbourne and Milan are so dismal at encouraging customers to try products on; is it a cultural thing? Is the training focussed elsewhere? Fashion outlets in those cities might do well to check customer service training adherence to test if there is something they should be doing to improve on their global standing. This isn’t just important for their own sales numbers, but from a competitive standpoint – if your competition looked at the data that yielded these results in Melbourne, they might just do something about it before you do. Frontline, bottom-line, etc.